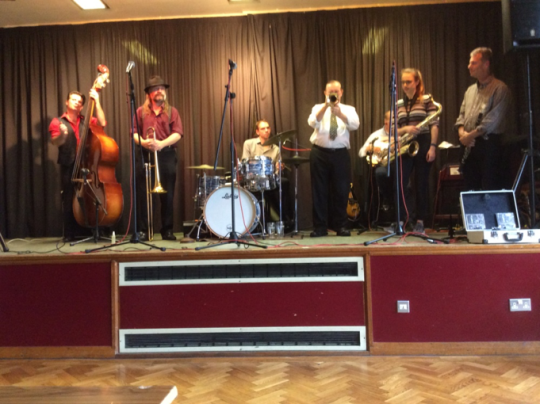 28 October – JB Jazz & Blues Band: Well this was it – the final performance by JB Jazz & Blues Band on the circuit. Roger Mainwaring had come out of retirement to play on this occasion and there was the addition of Owen Williams on bass guitar. Owen had been the original bass player when the band was first formed, under the name of JBQ (John Beckingham Quartet). This band was a three times winner of our coveted Band of the Year Award. John as always played the keyboard with enormous energy and was accompanied, in addition to Owen and Roger, by Phil Probert on guitar and banjo and Paul Holder on drums. The group seemed to put their very soul into this their last gig and the music, by turns lively and poignant, was sooo enjoyable. Some of the numbers were: ‘Pennies from Heaven’, ‘That’s the Story of Love’, ‘Hello Dolly’, ‘Caldonia’, and finishing with ‘Bye Bye Paris’ (surprisingly they couldn’t find anything about farewell to Stafford!!). 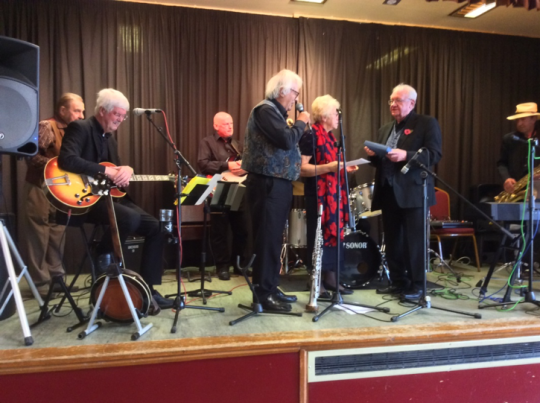 A presentation of an engraved dish was made by Shirley Ollier and Ian D’Arcy presented each member of the band with an SJS Pin Badge. 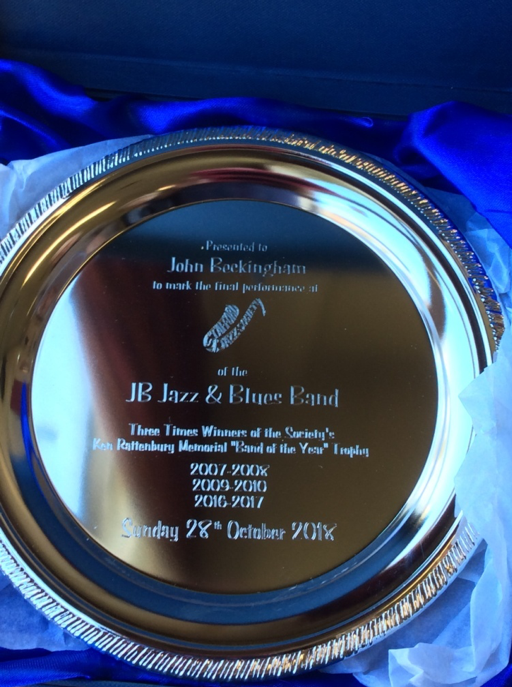 21 October – Baby Jools & the Jazzaholics: It’s always a joy to have this band play for us but especially today and with an extra long concert to celebrate the 37th anniversary of Stafford Jazz Society. Baby Jools on drums (leader), Mike Owen on trombone, Brian Mellor on guitar/banjo, Jim Swinnerton on double bass, Denny Ilett on trumpet and Karl Hird on reeds play together so well. The room was crowded and extra seating had to be brought in. Numbers included ‘Who’s Sorry Now’, ‘The Postman’s Lament’, ‘I’ve Found a New Baby’, ‘Black Bottom Stomp’ and ‘Since I Laid my Burden Down’. Joining the band for a few numbers was Alex Clark with her saxophone. 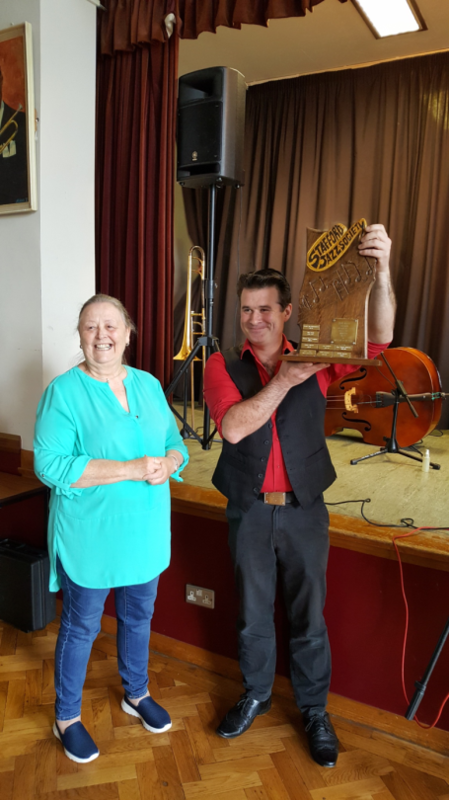 During the interval it was with great pleasure that Ann Crofts presented Jim Swinnerton with his award for winning SJS Musician of the Year Award and he seemed truly delighted. 14 October – No Concert. 7 October – Chase Jazzmen: Sadly I was not available at this concert, which I am given to understand was well attended, although there were some technical problems. You will find earlier reference to this band for concert on Sunday 8 April 2018.